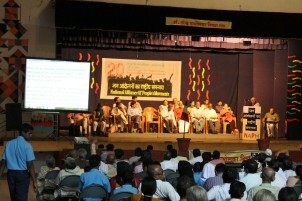 From 31st October to the 2nd of November, nearly 1000 delegates of 250 plus social movements and community organisations from 17 States of India gathered in Pune, in the state of Maharashtra, on occasion of 10th Biennial National Convention of NAPM, the National Alliance of People’s Movements. In critical times like this for India with regards to social and environmental issues, due to the new Modi government and its conservative and pro-development agenda, it was an important gathering, after exactly two decades from the NAPM formation. We discussed some of these issues with newly elected, National Convener of NAPM, Madhuresh Kumar. In the next blog, we talk to Ashish Kothari, environmental activists, founder and director of the NGO Kalpavriksh, an Environmental Action Group based in Pune. Madhuresh: “The struggle of Indian people has a long history, with roots in the colonial past and below. Emancipation and liberation struggles are going on since then, be them among villagers trying to preserve their natural resources, marginal farmers for their land, Dalits and so called “Other Backward Classes”, women and minorities and the millions of urban poor. In the 80s and 90s, the situation got much worse under the liberalisation and privatisation reforms. We have witnessed a parallel onslaught of imperialist globalization and a resurgent religious fundamentalism; the first one imposed disastrous structural economic reforms, the latter disrupted our society inculcating communalist hate and fear. As we look back, two processes might be considered as the benchmarks for its creation. The first one is the Harsud Rally in 1989 to oppose the Indira Sagar Dam in Madhya Pradesh, where affected Adivasis, Dalits, fisher people, informal workers marched together with prominent leaders like Medha Patkar, Baba Amte, Sunderlal Bahuguna, Thakurdas Bang, Shabana Azmi, Swami Agnivesh and others. The Harsud rally protested under the slogan “Vinash Nahi, Vikash Chahiye” (We don’t need distruction, we need development) and brought 35,000 people on the streets of a city of 20,000. The city was put under the Indian Official Secrets Act prohibiting gathering of more than five people. After that, a small group was formed and the Jan Vikas Andolan (Movement for People’s Development) was born. Since its inception, the stress was put on people’s development. The second incident which had a significant impact was the demolition of the Babri Mosque, at Ayodhya by hindu fundamentalists, who alleged it was built on a hindu temple dedicated to lord Rama. It became clearer and clearer that we could not separate the two main problems of our society. Globalization and liberalization with their new economic policies and casteism and communalism with the right wing Hindutva Politics, have always gone hand in hand and we have to fight that. In 1992, then, the process of coming together of hundreds of social movements across India started taking shape and got consolidated in 1996 after a long national tour of 15 Indian States by senior activists. It was a coming together without any intent to create any federation but a space for like-minded people who, while retaining their autonomous identities, could coordinate actions and reflect how a people-oriented development model should look like. Madhuresh: “Twenty-five years after the neo-liberal reforms, today development is synonymous with large scale grab of natural resources – jal-jungle-jameen (water, forests, land), including coal and other minerals. Be it State-, or private-led capitalism, the consequences are pretty much the same over territories and ordinary people. Reforms have allowed private actors to increase their profits and therefore private wealth accumulation has also increased. The discourse of sustainable development had initially tried to adjust to the same logic but it’s been now replaced by vigorous pursuit of achieving 8-10% of annual growth, which is promoted as panacea for India’s future. This has led to biggest scams like spectrum, coal and land clams recently, involving every big or medium size corporate house in the country. Today many communities are facing humongous infrastructure schemes, such as Special Economic Zones (SEZ) and the Industrial Corridors (IC). As of last February, the Ministry of Commerce had given formal approval to 576 and in principle approval to 49. Only 25% of these are in operation however, thanks to the stiff opposition of local communities which would lose land and sources of livelihood. Look at the Raigad SEZ in Maharashtra for example, or the Jhajjar SEZ in Haryana by the biggest Indian corporate house, Reliance, as emblematic spaces of such struggles. Industrial Corridors, a complex web of infrastructures, roads, rails, etc, fall under the same logic of opening up geographies of explotation, to remove bottlenecks and allow an easier extraction, processing and transportation. The Delhi Mumbai Industrial Corridor (DMIC) is the first such, followed by the World Bank backed Eastern Corridor (Amritsar Kolkata Industrial Corridor), or the Mumbai Bangalore Chennai IC supported by the British Government. The scale of these projects is unimaginable, since DMIC alone will impact 17% of India’s population and 14% of the land mass. Such schemes are deeply weakening democratic institutions as local government bodies are being systematically excluded. For example, the social movement, Sarvahara Jan Andolan (Movements of Destitutes), which successfully opposed Raigad SEZ, in the DMIC affected area received a notification saying that all the powers which rest with their gram panchayats (village-level assembly) have been taken away and now for all land dealings, they have to approach the Navi Mumbai industrial area authorities. The movement’s leader Ulka Mahajan told us that there has been no talk of this project at the parliament or legislative assembly level. When they started calling Members of the Union Parliament and of the State Lagislative Assembly, they found out they did not know anything about the DMIC. But how can such a decision be imposed without any discussion whatsoever?! Madhuresh: “The current development paradigm in the country is centered around an 8-10% growth rate. The Integrated Energy Policy of India, 2006 (released by the Planning Commission) recommends that by 2031-32 power generation capacity must increase to nearly 800,000 MW from the current capacity which lies at around 225,793 MW as per December 2013, inclusive of all captive plants. However, a study by the Prayas Energy Group observes that after the deregulation of the electricity sector in 2003-04 and entry of private corporations there has been completely unplanned growth and capacity addition. Coal- and gas-fired power plants are normally given environmental clearance by the Ministry of Environment and Forest, it is exstremely rare for a thermal power plant to be denied clearance. This means that there are around 701,820 MW coal and gas plants waiting in the cue for the next few years. But the most interesting thing to notice is that many of the projects in the pipeline will be geographically concentrated in a few areas. Less than 5% of all Indian districts will host more than a half of proposed projects; imagine the cumulative impacts on land and air quality! Moreover, the private sector is set to increase significantly; it counts today for the 73% of all projects in the pipeline while 10 private corporate groups are planning to build plants for about 160,000 MW. Many parts of the country is already facing severe shortages of water for drinking and agricultural uses; with growing population and additional large industries, there will likely be an unmanageble demand for water in the next years. So, the situation will become much more actue and stressful. Madhuresh: “India, post 1947, a country in the making, borrowed ideas of industrial modernity but failed to implement the principles of equality, justice and rightful development of every individual. What we have today at the confluence of so many social movements has its roots at least in the ’70 where many young students, influenced by the ideas of Gandhi, Marx, Mao and Jayprakash Narayan left their conforts back home and contributed, organizing and mobilizing social transformation in the villages. Feminists were also there and challenged the patriarchy while environmental concerns led to question the development paradigm. NAPM has to take over this legacy and continue working on building alliances, critiquing development but also expand its struggle over Science, technology and Information. Developing skill for data analysis and building an alternative narrative , writing articles, advocating for our causes on national and international platforms. The Right to Information Act 2005 is a result of the struggle of the movements, especially of Mazdoor Kisan Shakti Sangathan (Workers Peasants Power Organization). Also, it has to expand alliances beyond what has been done so far. In 2013, on the eve of anniversary of Bhopal’s disaster of Union Carbide (now Dow Chemical), many people’s movements, including NAPM, All India Union of Forest Working People, New Trade Union Initiative, Jan Jangharsh Vahini, Domestic Workers Union, Delhi Shahri Mahila Kaamgaar Union, Delhi Solidarity Group and others came together in Delhi to commemorate the disaster and issued a joint statement against the corporate power and impunity and calling for unity. Whether it is the struggle of Adivasis of Nyamgiri against Vedanta, villagers of Plachimada against Coca-Cola, villagers of Jagatsinghpur against POSCO, farmers against Monsanto, etc, the larger message today is that these are not segragated struggles against few specific evil corporations. It is a challenge to the unaccountable power of the larger Corporate Structure. The principle of trusteeship with the values of self reliance and ecological sustainability can lead to true alternatives to current model of development with people at its centre. NAPM’s philosophy and action is part of that agenda. The just concluded convention have decided to undertake a larger programme and we hope to make it work with the help of others. The challenge today also lies in how to start seeing every actor, grassroots movements, community groups, left political parties, NGOs, research instiutions, students and teachers in universities and everyone part of struggle for social justice in India. The need for united action today is felt much more than ever. There are processes of convergence taking shape but a lot of work still needs to be done.